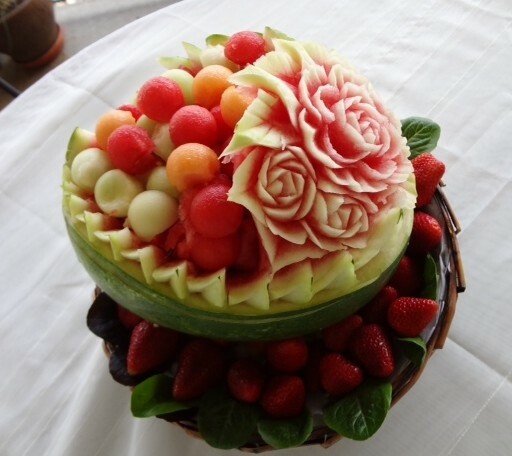 Fruit carving became a way to make weddings, anniversaries, teambuilding, various events more stylish. Fruit carving can be achieved by multiple examples and instructions on the internet but also by designing new models using your imagination. These fruit sculptures or „fruit bars" cost between 300-500 euro and even more if there are some special preferences from the organizers. Before you start experimenting on fruit you must take in to consideration that there are some fruits that due to rapid oxidation can alter their appearance, in this category we find apples, bananas, peaches, apricots, pears. If you want to use this fruits don't take the peel off or use lemmon juice (if used slice fruits) combined with cold water. The fruits mostly used for carving "fruit bars" are watermelon, cantaloupe, strawberries, pineapple, kiwi, grape, mango and many others depending on imagination, you just have to aproximate time of work, time of the event and time before the fruit alteration. These carvings of fruits or " fruit bars " have become increasingly popular on the market. Hard work, lot of practice and a little imagination you cand easily make, in a few hours of work, a good monthly wage. 0 Response to "Fruit carving"